From all of us at Morris-Depew Associates, Inc. we hope you had wonderful holiday celebrating our independence with family and friends. Morris-Depew Associates, continues to support the redevelopment of historic structures on Boca Grade. Recently, Ken Gallander, AICP, Principal Planner, Ryan Shute, PE, Partner – President, and Michael Ekblad, PLA, Director of Landscape Architecture in coordination with project architect Johnathan Parks, AIA, from Solstice Planning and Architecture, received unanimous approval from the Boca Grande Historic Preservation Board as well as Lee County for a Special Certificate of Appropriateness (COA), Administrative Amendment for Historic Relief (ADD) and a Development Order (DO) to redevelop Boca Blooms . Boca Blooms is an existing flower shop and two additional parcels to create a small commercial plaza with pedestrian and customer gathering spaces and tea room. The approvals allow for specific renovations to the existing buildings and promote further enhancement of the site through appropriately located and designed landscaping, public gathering areas, and accessibility to complement the existing flower shop and new café. 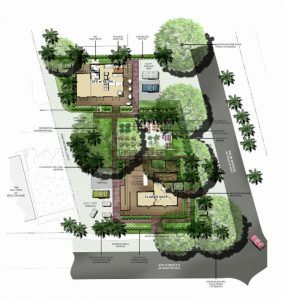 This collaborative effort is an opportunity to rehabilitate and redevelop the property in a manner that will ultimately enrich and sustain the character and ambiance of the Boca Grande Historic District. Michael Ekblad, PLA, Director of Landscape Architecture, continues to advance the graphic capabilities of Morris-Depew Associates. Recently for several on-going cases, Michael utilized SketchUP and Google Earth to demonstrate the perspective of proposed high rise developments from adjacent residential properties. The prepared 3D graphics can be utilized as presentation boards to demonstrate the general view and architecture of the proposed development as well as with multiple Google Earth locations to provide a video fly-through perspective from multiple building locations and surrounding uses. Lee Health, HKS Architects Skanska-Gates, and Morris-Depew Associates, Inc. continue their efforts to expand the existing facilities at Gulf Coast Medical Center. Bill Morris, PE, Partner – Director of Engineering, Michael Ekblad, PLA, Director of Landscape Architecture, Mark Hatfield, PSM, Partner – Surveying Director and Don Miller, PSM, Assistant Director of Surveying all collaborated to provide services in support of the expansion project. Instrumental to the building design efforts by JKS, Mark Hatfield and Don Miller of the Surveying Department have prepared new boundary and topographic surveys and an extensive as-built survey of the existing hospital campus. Detailed surveys were performed by the department for the structural engineer and architect designing the expansion. All key structural elements on the roof and interior hallways on the ground floor of the existing hospital were precisely located. Each of these elements plays a critical role in the final design of the project as related to structural, mechanical, and electrical fundamentals of the addition. Finally, as the first phase of construction began to support the building expansion, the survey department provided construction staking of all the pivotal foundations. This included the location of footers supporting the new parking garage, the roadway alignment for vehicles to access the parking garage and all supporting infrastructure, lighting, curbs, water lines, etc. Troyer Brothers Farms, located in eastern Lee County has requested an amendment to the Lee County Comprehensive Plan to include the property within the County’s Mining Overlay. On April 5, 2017, the Amendment request was heard by the Lee County Board of County Commissioners and approved for transmittal to the Florida Department of Economic Opportunity in Tallahassee for review. Tina M. Ekblad, MPA, AICP, LEED® AP, Partner – Planning Director, and David W. Depew, PhD, AICP, LEED® AP, Principal, assisted with planning and project coordination, Michael Ekblad, PLA, Director of Landscape Architecture, provided graphics, buffering plans, and assistance with reclamation programs, Ryan Shute, PE, Partner – President, dealt with surface water management, pollution prevention, and site civil engineering issues, and Mark Hatfield, PSM, Partner – Director of Surveying, was consulted for survey, legal description, and legal sketch elements of the application materials. A request for a Mining Excavation Planned Development has been filed concurrently, and if approved, the proposed development would permit 781 acres of resource extraction and a reclamation plan that creates over 1,000 acres of open space and hydrologic restoration. Michael Ekblad, PLA, Director of Landscape Architecture, Ryan Shute, PE, Partner – President, and Stephen VerVaecke, EI, Project Engineer, are developing construction plans for a parking lot and entry renovation to the Fort Myers Broadcasting Company‘s existing facility. When implemented, the design will enhance the existing Palm Beach Avenue corridor by supporting the existing streetscape, removing excess parking, and increasing pervious areas. By providing an attractive gathering space with modern finishes and sleek landscaping, the design will unify the center’s exterior and interior spaces and emphasize pedestrian connectivity to the site. The project is currently being reviewed by the Florida Dept. of Transportation, the South Florida Water Management District and the City of Fort Myers with approvals expected later this month. The project is being constructed by Owen-Aims & Kimble and associated sub-consultants, and is expected to be completed fall of 2017. David W. Depew, PhD, AICP, LEED® AP, Principal, provided expert testimony for the developers of Dylan’s Grove, Phase 2, before the Newberry City Council in support of a re-development plan that had evolved from the court ordered break-up of the original property. Looking at the equity associated with the Circuit Court’s final order, the application of Newberry’s land development regulations, the physical components of the existing Phase 1 – utilities, roadways, open space, etc. 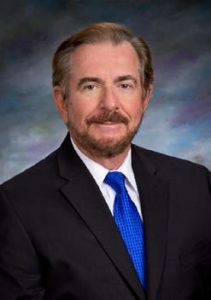 – Dr. Depew helped to provide a basis for the proposed re-development plan that was approved unanimously by the City Commission. Morris-Depew Associates, Inc. successfully assisted in the settlement of a complicated condemnation action in the City of Port St. Lucie between Liberty Medical and the Florida Dept. of Transportation. Located along the proposed Crosstown Parkway Extension, Liberty Medical’s property was partially developed, with the taking intended to provide drainage facilities for the roadway expansion. David W. Depew, PhD, AICP, LEED® AP, Principal, was assisted by Bill Morris, PE, Partner – Director of Engineering, and Michael Ekblad, PLA, Director of Landscape Architecture, in developing cure plans for eventual approval by the City of Port St. Lucie, minimizing the impacts of the taking and assuring the long-term functionality of the site. 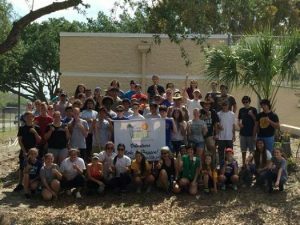 Michael Ekblad, PLA, Director of Landscape Architecture and Board Member for Keep Lee County Beautiful, along with various members of the Morris-Depew Associates team supported Keep Lee County Beautiful’s Street Tree Planting at Cape Coral High School project. Early in the planning efforts, Mr. Ekblad worked with a select group of High School students to create a design that would add beauty to the surrounding community and promote public gatherings on school grounds. This first phase of the design was completed earlier this year (to coincide with Earth Day, Arbor Day, and National Landscape Architecture Month) which saw 100 volunteers successfully plant over $10k worth of trees on the school’s property. A special thanks to our corporate sponsors that donated time and materials for the project. Without their contributions, this project would not have been possible. Thank you to Dan deMont from Juniper Landscaping, Rick Kruszewski from Sunnygrove Landscaping, Cheryl Ronan, from Anova Furnishings, and Leigh Gevelinger on behalf of FLASLA & FLAA (Florida Chapter of the American Society of Landscape Architects) & (Future Landscape Architects of America), for your very generous donations toKeep Lee County Beautiful. It was a better project because you were involved.